The Government of Cameroon and the Center for International Forestry Research (CIFOR) signed an agreement to guarantee the survival of Cameroon's forests and the livelihood of people who depend on forests. "Cameroon is an important piece in the jig-saw puzzle of the six Congo Basin countries, which contain the world's second largest rainforest," noted CIFOR's regional co-coordinator, Cyrie Sendashonga. Central Africa's Congo Basin harbors enormous plant and animal diversity. Its forests also contribute to the survival and livelihood of millions of people. According to the World Bank, forests around the world provide 1.6 billion people with food, fuel and other life-essentials. One in four western pharmaceuticals is also derived from rainforest ingredients. For more information, contact Janneke Romijn at j.romijn@cgiar.org or visit http://www.cgiar.org/monthlystory/april2007.html. "If you dance, you vibrate - and he who vibrates lives." Mount Cameroon, West Africa's highest peak, stands like a giant sentinel, gazing out over the Gulf of Guinea on Africa's Atlantic Coast. Among it's legendary names is "Throne of Thunder," a fitting tribute to the powerful gods that are said to inhabit the mountain's inner core. Our group of travel agents and journalists approached the 'throne' shortly after one of its frequent volcanic eruptions, and the ribbons of cooled lava resembled grey frosting oozing from an enormous layer cake. The lava beds are evident from the main highway to Kribi and a hiking trail winds up and over them. The warning signs advised us to pay respect and to tread gently in this eco- sensitive area. Mount Cameroon's rugged peak is the crown jewel of a chain of volcanic mountains that are strung like a giant pearl necklace along the Cameroon Nigeria border. The range stretches from here all the way to the northern plains of Maroua, gateway to Waza National Park - and that's just part of the "Grand Tour of Cameroon, Africa in One Country" a prestige edition of Africa Travel Magazine making its debut in fall 2004. Cameroon's Minister of Tourism (at the time) , Hon. Pierre Helé, puts "ecology first" in his country's efforts to win an important share of the tourist trade from North America and other markets. Each February the popular ' Course of Hope.' attracts aspiring climbers to the area and we're told that, while the ascent is challenging, it's not dangerous or overly strenuous. Many other sights would amaze and impress us that day and in the week to follow. Speaking personally, this trip was by far the most complete tour of any ATA- African host country I had experienced to date. At its conclusion most travelers in our group were tired - and somewhat bedazzled - yet I enjoyed a feeling of solid accomplishment. As a result I will never forget Cameroon and always hunger for more. This progressive country is already high on the preferred list in terms of business travel. Scan the financial pages, or dig a little deeper in the Internet, and you'll see what I mean - the country is rich with potential in terms of agriculture, forestry, marine life, minerals and natural resources. And a word to the wise, "Where business goes, tourism flows" - and vice versa. 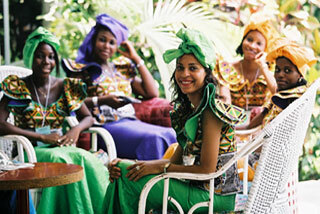 Europeans discovered long ago what most North Americans have yet to learn - that Cameroon is a Tourism Mecca in the raw. Ministry officials agree with with the popular expression that their land is Africa in One country." In other words Cameroon is a little bit of everything, or as my Grade 9 Spanish textbook said in its title, "de todo un poco." Editor's Comment: In addition to the Hon. Minister Hele, we thank our tour supervisors Ebenezer Elimbi, Jean Npombo and Boniface Piga. They were great companions throughout my 30 days in the country. Our travels in Cameroon will eventually be compiled in a book that will help future travelers from North America enjoy this fascinating country to the fullest. It was a month we will treasure forever, and even as time passes, the images and voices of Cameroon have not faded one iota - they've become even more vivid in the theater of my mind. What I truly love about the many Cameroonians whom I've come to know - is that to a person, they "Accentuate the Positive." Located on the West coast of Africa,Cameroon (population 15,000,00) is bordered by Nigeria, Gabon, Chad, Central African Republic, Congo and Equatorial Guinea. While there are over 200 tribal groups, the main languages of commerce are French and English. Much of the architecture remains from the country's days as a German colony. Cameroon's Atlantic Ocean coastline extends 400 km, offering long stretches of beach. The varied climate ranges from tropical rain forest to open Savannah, with high mountain ranges on the North West border. Throughout Cameroon there are areas of thermal springs for those who like an outdoor health spa retreat. As they say, "A little bit of everything." Waza National Park. 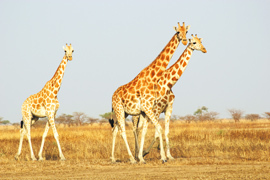 Visitors can observe elephant, giraffe, ostrich, antelope, gazelle and lion - and a variety of birds. Lions are best observed during April. Cameroon contains various national parks spread throughout the country. The Waza National Park covers an area of 170,000 hectares and includes lions, giraffes, elephants, cobs, ostriches, sassabies (antelopes), leopards, waterbuck, etc. It is the most famous park in Cameroon and one of the most spectacular in French-speaking Africa. Located in the Far North Region, 120km from Maroua, it is a haven for the big cats and other animal species as well for many varieties of birds. This park is an absolute must to discover. 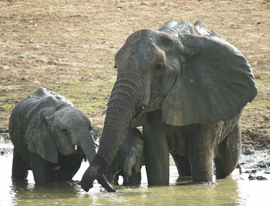 The Bouba Ndjida National Park extends over 220,000 hectares. Rhinos, lions, Lord Derby Eland (antelopes), elephants, etc., are all to be found here. It is situated in the North Region, 270km from Garoua and is considered THE area for rhinos. 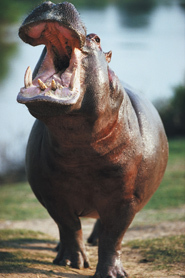 The B�nou� National Park with a surface area of 180,000 hectares contains a large number of hippos, Lord Derby Eland (antelopes), hyenas, panthers, etc. Situated in the centre of the North Region, 170km from Garous, it is the favourite place for the largest antelopes such as the Lord Derby Eland. The Faro National Park, 225km from Garoua,extending over 330,000 hectares, is a park where rhinos, buffalo, elephants, giraffes, etc., may easily be spotted. The Kalamalou� National Park, with its 45,000 hectares on the Mokolo road in the Far North, is above all, a special place for botany enthusiasts. The Mozoko Gokoro National Park, covering 1,400 hectares, is exceptional by way of its wealth of plant and animal species. It is situated in the Mayo Tsanaga D�partement, in the Far North Region. The Korup National Park is located in the South-West Region, and is a forest reserve known throughout the world covering an area of 125,600 hectares. It is considered as one of the oldest and most beautiful tropical forests in the world. Its wealth of flora and fauna derive from the fact that Korup survived the ice age and is now a true ecological treasure. The Lob�k� National Park extending over 4,300 hectares is a forest and animal reserve, as well as being a gorilla sanctuary, in the east of the country. The Campo Ma'an National Park in the south of the country boasts a rich variety of animal species, being inhabited by elephants and chimpanzees which take advantage of the luxuriant forest. Apart from the National Parks, Cameroon offers many reserves devoted to flora and fauna. Pangar-Djerem, Dja, Kribi, Mbi Crater, Douala, Ed�a, Kalfou, Lac Ossa, Santchou, Bafia� to name but a few. The Dja reserve is a sanctuary for gorillas and chimpanzees and various other animal and plant species may be observed here. Generally speaking, possibilities for exploration and discovery are available just about everywhere in the country, including in close proximity to towns. The beautiful landscapes of the West and North Regions are particularly suitable for picnics. Cameroon is a true crossroads of African art and culture and contains more than two hundred ethnic groups which make up the profuse artistic and cultural heritage of the country. Pygmies, Bantus, Sudanese, Arab-Berbers and many others form this extraordinary mixture of populations, with each ethnic group contributing its traditions, art and music. 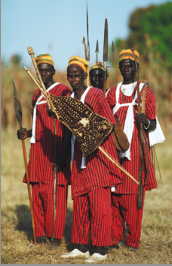 The �Ngondo� and �Mpo'o� tribes on the coast combine dance, magic, disguise and canoe races. In the West and North-West Regions, funerals are occasions for big, highly colourful ceremonies, in honour of the deceased. During the ceremonies held in the North, you can watch magnificent colourful processions. The �buma� dances are typical of pygmies from the south of the equatorial forest. Masks, statuettes, music instruments, everything adds up to perpetuate age-old traditions and rites of the African continent.